LONDON--(BUSINESS WIRE)--The global cognition supplements market is expected to post a CAGR of close to 14% during the period 2018-2022, according to the latest market research report by Technavio. A key factor driving the growth of the market is the increasing preference towards maintaining a healthy lifestyle. Increasing health consciousness among people has led to a higher consumption of foods that provide greater health benefits. With an aim to lead a disease-free life, people are increasingly engaging in physical activities, and choosing organic and homemade food. This has also increased the consumption of dietary supplements that help maintain the daily dose of vital nutrients required by the body and are, therefore, associated with good health. Therefore, with changes such as these, the market is expected to show a positive outlook over the next few years. This market research report on the global cognition supplements market 2018-2022 also provides an analysis of the most important trends expected to impact the market outlook during the forecast period. Technavio classifies an emerging trend as a major factor that has the potential to significantly impact the market and contribute to its growth or decline. The proliferation of e-commerce platforms and the increasing number of consumers shopping on these platforms have simplified the diffusion process of adoption. Consumers can easily navigate through these platforms and access a wide range of products. Growing e-commerce provides an opportunity for vendors to open their own online portals to ease the customers’ shopping experience showcase their product line and improve their visibility by representing multiple products on a single page. Online retailing helps vendors cater to their customers directly rather than through a distributor. Many vendors are adopting online retailing and internet marketing as a strategy to diversify their geographic focus. Therefore, online retailing will emerge as the fastest channel of distribution during the forecast period. “Apart from growth and acceptance of e-commerce, the rise in aging population and use of social media to market products are two major factors that are expected to boost the growth of the overall market,” says a senior market research analyst at Technavio. This market research report segments the global cognition supplements market by application (memory enhancement, mood and depression alleviation, attention and focus improvement, and others) and geographical regions (APAC, EMEA, and the Americas). The memory enhancement segment led the market in 2017 with a market share of over 36%, followed by the mood and depression alleviation and attention and focus improvement segments respectively. However, during the forecast period, the mood and depression alleviation segment is expected to show the highest incremental growth. 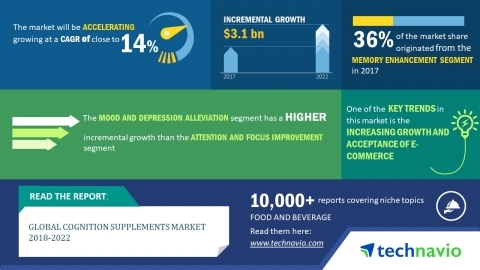 The global cognition supplements market is expected to post a CAGR of close to 14% during the period 2018-2022, according to Technavio.